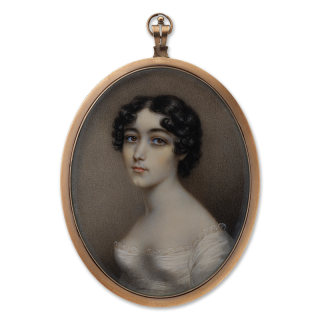 Lack of definitive provenance makes it difficult to be sure that the young woman represented in this miniature is Plimer’s youngest daughter, but she bears a striking resemblance to other portraits of his daughters and particularly to those of Selina. Plimer also painted his wife (Joanna Louisa) and children in a distinctive manner, their faces particularly expressive, the composition such that the sitter’s head filled a large proportion of the frame. Other portraits of Selina show her darker in complexion than her sisters, with large, brown eyes.